I am very pleased to welcome you all to the 2017- 2018 school year! I would like to extend a special welcome to all of the new families who are just joining our ISLA community in kindergarten and other grades. We are very excited for the new school year, and we encourage all new parents to get involved, as ISLA depends on the dedication of our committed cadre of volunteers; indeed, it is one of the factors that makes our school community so strong, and is a hallmark of any successful school. For this school year, we are delighted to announce that we have made some significant improvements to our report card systems. During ISLA’s last reauthorization visit, one of the International Baccalaureate Organization (IBO) recommendations was that we should work toward having our assessment reporting reflect the work done at each grade level within the units of inquiry. Utilizing that feedback, a task force designed a new report card that we feel really reflects our IB/Immersion mission, and allows teachers to give feedback on the essential elements within the Primary Years Program (PYP). This change will also effectively move our school to a semester reporting system, with report cards being sent out two times: during the first week of February, and again in June. Additional assessment information which informs instruction will be communicated to families throughout the school year, including: Aimsweb data analysis in reading, literacy, and mathematics skills results in October, January, and May; Parent Teacher Conferences in November and April; and Measures of Academic Progress (MAP) testing results in October and June. Green Space Update: our campus improvement project ran into some unforeseen complications regarding stormwater management while applying for building permits with the City of Minnetonka and the Nine Mile Creek Watershed District, which delayed work for this year; however, the engineers working on this effort have assured me that we will definitely be able to start construction in the spring of 2018. Although this is an unfortunate delay, our students will be pleased to know that they will still have a new piece of playground equipment installed in October. This climbing structure is partially funded thanks to the impressive efforts and support of all of the members of our ISLA community, who raised funds last spring in our Stepathon last spring. Well done, students! On Thursday, September 14th, from 6:30 to 8:30, ISLA will host our annual Curriculum Night for all staff and families, which will be coupled with our annual State of the School address. This is an important evening for ISLA, as the State of the School presentation puts us in compliance with Minnesota Statute 120B.11, which “requires that a School Board, at a public meeting, shall adopt a comprehensive, long-term strategic plan to support and improve teaching and learning that is aligned with creating the world’s best workforce.” This evening will also give all parents the opportunity to explore volunteer opportunities at ISLA, followed by classroom presentations in your child’s classroom. Each grade level will conduct two identical presentations, allowing those with children in more than one grade level to attend both presentations. We look forward to seeing you then, as well as at the Back to School Picnic on September 17th! Once again, I would like to welcome you to the 2017/2018 school year here at ISLA. We look forward to continuing our work in academic excellence and growth through language immersion, and fostering global citizenship through the International Baccalaureate program. I wish you and your family all the best in the new school year. Thursday, September 14th, 6:30-8:30 pm is curriculum night and our State of the School Event. This is an event for PARENTS/GUARDIANS only. You will learn about the themes your child will explore this year, teacher expectations, homework, routines and more. Each grade level will conduct two identical presentations, allowing those with children in more than one grade level to attend both presentations. We will begin with an all-school presentation in the multi-purpose room at 6:30 pm. This will be a time to introduce all ISLA staff. Presentations will take place in the classroom. We hope to see you then! 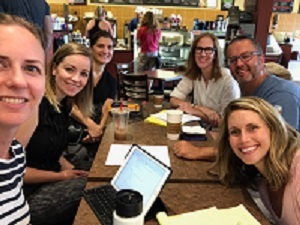 The ISLA School Board met in July and August and are excited to welcome new ISLA families and faculty, returning teachers and staff, and a great new group of Language Ambassadors! Please look for these monthly updates from the ISLA School Board to inform you about the governance, finances, and planning for ISLA. A technology task force reviewed their findings about best ways to support the Technology Committee and ISLA administration in their growing tech needs. At both the July and August meetings the board hear from teachers, administration, and the technology committee, made up of parents, to review best practices and some of the great things that ISLA is already doing in the classroom to support 21st Century tech learning for kinder-6th grade students. The ideas of coding, a maker space, and engineering ideologies often align strongly with ISLA’s International Baccalaureate focus and curriculum. The State of the School and Curriculum Night are going to be combined this year. Combining these two events will allow parents to engage in volunteer sign-ups, classroom communications, and a stronger understanding of how ISLA students are being prepared for the “World’s Best Work Force,” a state mandated reporting program for every school in Minnesota. All ISLA School Board members will be attending a planning and professional development session with Carlo Cuesta, from Creation in Common. Mr. Cuesta is known for developing strong collaborative approaches with leadership teams. I am so proud to introduce ISLA’s Marketing committee! We have a wealth of expertise in the industry and also within ISLA as we have a parent at nearly every grade level! At the moment, the Committee is focusing on the Spring ‘17 marketing survey so we can respond to community feedback. We are also working on print materials and other fun projects. Manager of Organizational Readiness, Medtronic. Parent of Bellamie, 1st grade. ISLA’s Marketing and Communications Committee is a subcommittee of the Board of Directors. Any parent can join Board committees. It is a great way to be connected with the inner-workings of our school and lend your talent or explore your interest. Meetings work around busy work and family schedules. Thank you to our amazing team!